The Canadian election is over and the American presidential campaign is heating up. Justin Bieber’s adolescent petulance has again made headlines and pictures of celebrities in Halloween costumes have been spamming my Twitter account. CEOs at Volkswagen, a couple of banks, an oil company, and those running Soccer’s FIFA World Cup have been behaving badly. Perhaps it is an appropriate moment to consider narcissism. 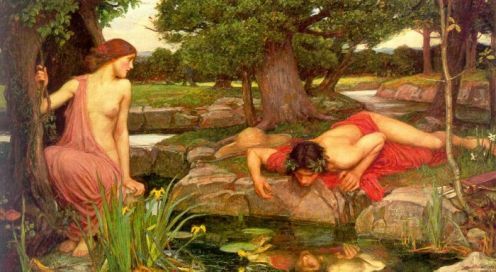 The word derives from the Greek legend of a handsome young man named Narcissus who fell so head over heels in love with himself that he devoted days to gazing longingly at his reflection in a pool. He eventually died and was transformed into the flower called narcissus. In 1914, Sigmund Freud used the legend to discuss the problem of excessive self-love. In the 1970s, University of Chicago’s Heinz Kohut deepened our understanding by writing that all children have a grandiose sense of self and see others as merely pawns. Due to a trauma they may not recall, and may not have even been a negative experience, some people never move past that stage. Kohut dubbed the result a narcissistic personality disorder. A narcissist always makes a good first impression because he is irresistibly charming, witty, and confident. It’s an easy act because his life is a performance. He is often a loving spouse and parent, for example, as it allows yet another demonstration of his ability to master difficult tasks. He often gets things done at work because he swiftly clears aside obstacles whether they are people or established practices. If caught doing something unwise or illegal, critics are dismissed as jealous or mindless ‘haters’ and rules or laws as merely misguided impediments. Narcissistic leaders are capable of shoe shuffling mea culpas but privately smile at critics and criticism as bothersome bumps on the road constructed by poor souls who will eventually understand that all will be better when they are allowed back on the bridge with only their hands on the tiller. Consider Richard Nixon or Bill Clinton. Washington University’s Erica Carlson writes that it is this combination of self-awareness and refusal to accept criticism or consequence that results in narcissists never believing that they need to change. Narcissists are incapable of change. The world must change to suit them and not the other way around. Consider Kanye West even before he announced that he would run for president. Not all leaders are narcissists and not all narcissists are leaders. But, according to Dr. Thomas Paine, narcissists are overwhelmingly represented in leadership positions in sports, entertainment, politics, and business. Paine warns us to watch for a leader who is a charming conversationalist but always brings talk back to himself or his preferred topic. Watch for a leader who surrounds himself with sycophants and banishes those with long corporate memories and others who challenge his views or goals. Look out for the leader who can feign empathy but whose goal-driven actions aggrandize himself and his personal metrics of success while revealing no genuine concern for the feelings or even the lives of others. Watch for the leader who smiles at adversity with the confidence that he will weather all storms and emerge triumphant. Most importantly, he warns, watch for leaders who value their success more than that of the organization they lead. Consider Donald Trump. Narcissism is more important than the Beibs or Kardashians. It is more important than measuring your personal rate of selfies per hour. Our intersecting worlds of culture, business, and politics matter a great deal and so the slippery slope from confidence to arrogance to narcissism among some of our leaders in each world matters. In fact, it is crucial. If you enjoyed this column, please share it with others through Facebook or your social media of choice. Another splendid piece, John Boyko.